This is the source of the River Barrow, in the woods on the Sliabh Bloom Mountains, west of where I live. It flows north before turning east and then south, to enter the sea at Waterford. Its route takes it through my home town in Kildare. Here its a broad substantial river, onetime part of the western boundary of the English Pale. This painting uses similar colours (Yellow Ochre, Burnt Sienna & French Ultramarine Blue) to the previous painting. But the approach is different, right from the outset. In the previous painting the initial under layers were mixed with white to produce opaque light colours and the final colours, darker, were ‘drawn’ on top, similar to a watercolour painting. In the painting above, dark rich transparent colours were built up progressively and the lighter colours placed on top, as in the traditional oil painting method. I didn’t completely abandon all the watercolour treatments. 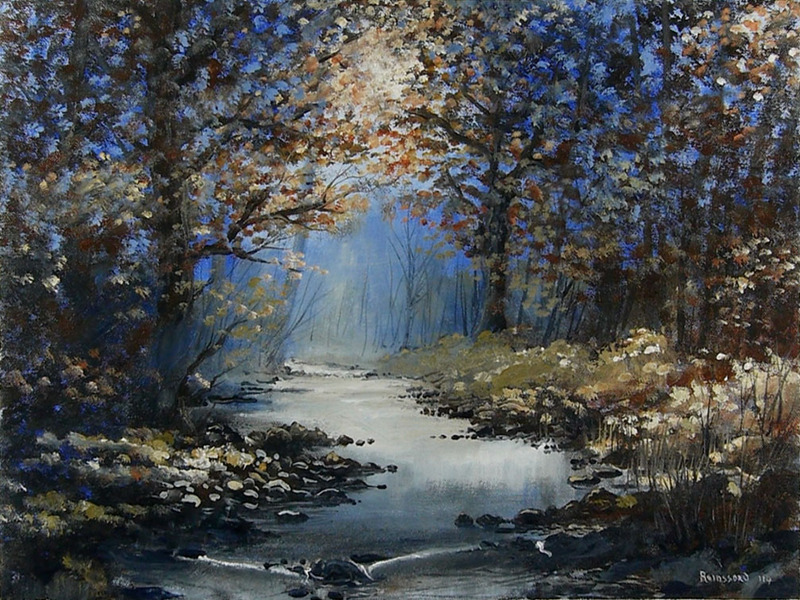 There are places where ‘washes’ of colour are allowing the canvas colour to shine through (the trees and shadows, lower left). This gives a vibrant, shimmering light and adds a sparkle to areas that tend to be dark and muddy. I also used a nylon watercolour brush to add details on the rivers edge and the smaller trees and branches. The size is 16″ x 12″, using 3 colours plus white. Apart from the details, using the narrow nylon brush, the entire painting was completed with a single round No. : 12, bristle brush in 2 and a half hours. My colours ‘evolved’ from mix to mix, without cleaning the brush. As only the 3 mentioned colours were used there were none of the ‘muddy’ colours you get from too many incompatible colours mixing together. Obviously, there are never more than 3 in any mix, and even this is a rich range of greys varying with the proportions of the individual raw colours. My pleasure. Thank you for inspiration and beautiful experiences of art in the making. Glad you like, thank you. This one really stands out with amazing colors that invite one into the painting. I want to go down that creek and see where it comes from.